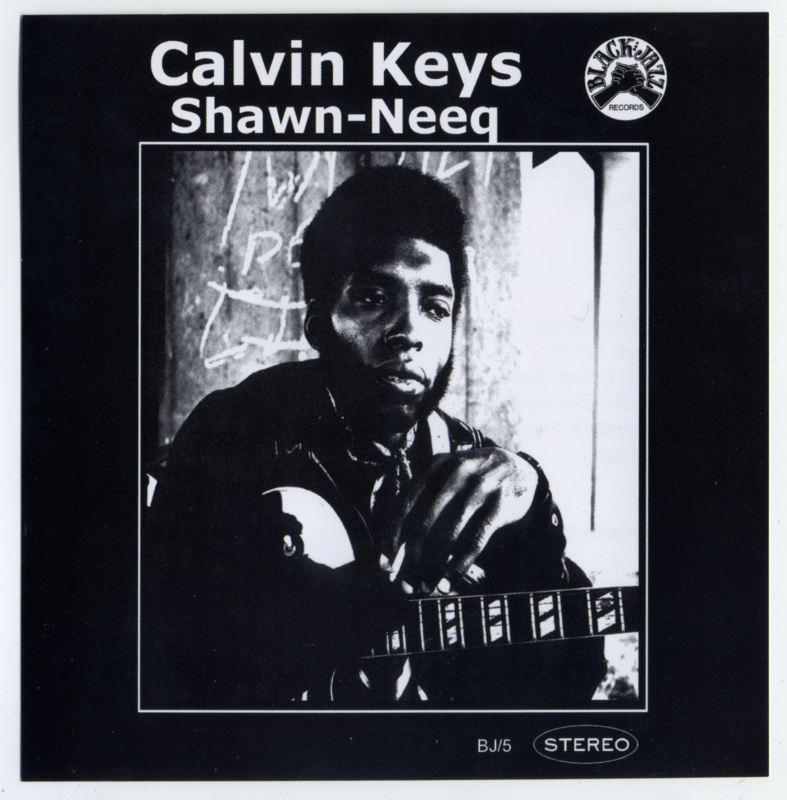 This is a gratifying, if a little tentative, first outing for Oakland guitarist Calvin Keys as a bandleader. Recorded for the Black Jazz label, it has all the elements of “rare groove” you would associate with that imprint, with lots of modal jamming and solos that push oh-so-slightly to the outside. Larry Nash on the electric piano is particularly good, and there are some exciting and bewildering sounds from Owen Marshall, credited here on flute, “hose-a-phone,” and “miscellaneous” – he was known to invent his own instruments. Whatever is screeching and squalling on the opening track B.E. sounds like a violin at times, but probably isn’t. A chimerical character behind one of the seriously collectable independent and private press jazz records from the early and mid-70s (Captain Puff In The Naked Truth), you could say Owen Marshall is this record’s secret weapon. Drummer Bob Braye doesn’t quite hold the rhythm together in a way that I’d like, unless that tense feeling of just barely keeping it from falling apart was actually his calculated approach. One exception is the funk groove of B.K. (Burger King?) in which he keeps everything in the pocket and nails it there for nine minutes. It’s better if we just don’t talk about the sound of this reissue. It claims to be a straight transfer from the 2-track master, but if that’s true then somebody was nodding off on the job. The less said about it, the better. All in all, a solid record, but for me it’s really a prelude to his second release on Black Jazz, titled Proceed With Caution, which surpasses it in every way. With any luck, that might well be my next post here. Also, Calvin Keys may have kept a low profile throughout his life but he is still around, and released a record in 2013 called ‘Electric Keys’ (Wide Hive Records) which is definitely worth checking out! Tagged Black Jazz, modal jazz, Soul Jazz. Well this has been up for over a week and nobody seems to care about it at all based on the complete and utter lack of comments and response to it, so I guess nobody is interested in his second album. Too bad. Great stuff. Never heard this early Black Jazz work before. been looking for this one! Thanks!! I didn’t visit that gem of a website you have for a while since I don’t have internet at my apartment.Can’t wait to listen to this,thank you!! You’re welcome! Is this the Brighton DJ R.Louis hanging out at my blog? I have always loved B.K. but have never heard the entire LP. Thanks. Even better to hear that the 2nd is even more special! i came across the entire black jazz discography as a torrent a few months back. lots of gems. i’ve been picking up reissues when i can find them, mostly doug carn records. I have everything that was reissued on CD in FLAC format… I’ve just been really lazy about posting about them as I prefer to wait until I have time to say think about the records and say something. What format is your discog in and what was the source material (e.g. vinyl or CD)? unfortunately, i don’t know much about the original rips, or whether they came from vinyl or CD. i stumbled across the torrent on another blog, but since I’ve learned more about the label and it’s history. if i had to guess…they may well be CD rips from the reissued CDs you have mentioned, based on what i know about the history of the label, and its catalog. They’ve been reissued a couple of times (once, quite recently), and there seems to be some dispute over who actually owns the rights to their back catalog, as often happens with small labels that had a small footprint but huge impact after they dissolved. It’s one of the reasons I feel people should share the music whenever and wherever possible, actually. I’d be happy to have a listen – the batch that I have all came out around 2005, and some of them sound downright awful, like they were sourced from moldy vinyl copies left in an attic for thirty years, and others sound just fine. Also, it’s possible that the series did not reissue *all* the label’s titles although they claimed that was their intent back then, I kept meaning to dig deeper and find out – all the info is out there by now. Send me a PM on the site with a link if you like.